FANBOY PLANET.com . : mc-johnbalenDisneyStore :. 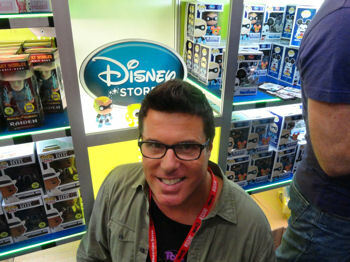 John Balen Leads The Disney Store To Comic-Con! For a few years when we've trekked to Comic-Con, occasional podcast contributor Jason Salazar has returned to the hotel room laden down with products from Funko. So when a representative from the Disney Store asked if we'd be interested in meeting up at the Funko booth, it seemed a no-brainer. Alas, Jason spent our interview time in line to BUY Funko products, in particular the ones we were there to talk about -- so I guess that worked out after all. Jason got several POP! Vinyl exclusives, and I got to do my favorite things at Con -- discover something new and have a conversation with someone who is at Con NOT because he has a product to sell (though he does) but because he's a fan (and he is). 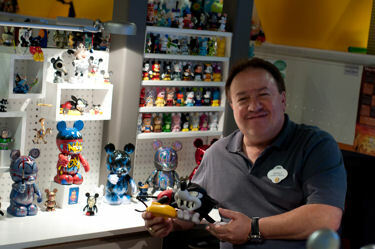 John Balen has what some might call a dream job -- "Director of Toys" at the Disney Store. It's clear from our conversation that he loves what he does for all the right reasons, and though, yes, your shelves might be groaning because he's good at what he does, can you blame him? He cares about toys, he cares about the products and yes, I'll venture to say with enthusiasm, he cares about the fans. DEREK MCCAW: Why do a line of POP! 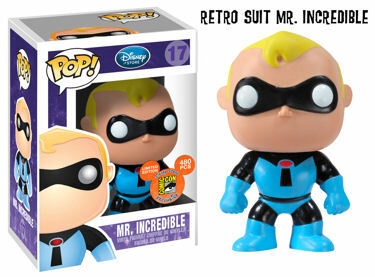 Vinyl with Funko? We ran over to the booth immediately. We fell in love with the line. It was so, honestly, adorable. We fell in love with how cute the characters were, but it was also really stylish and edgy at the same time. We just saw a really broad opportunity. It could appeal to little kids, but it also appeals to adult vinyl collectors who love the art style and the edgy look and feel of the characters. DEREK MCCAW: Did I hear you say earlier that this is the first time the Disney Store has come to Comic-Con? JOHN BALEN: It is. It’s the first time we’ve had products that have been developed by Disney Store available here at Comic-Con and for sale at Comic-Con through one of our vendors. So it’s been really amazing for us. JOHN BALEN: We have only 480 pieces available of each one of the 3 inch series, so we expect those to be sold out this weekend. We also have 360 pieces of two 9 inch series that are coming in. They’re a little bit late, they got delayed in the shipment so they missed tonight (Wednesday) but they’ll be in tomorrow morning. JOHN BALEN: (laughs) Yeah! They have proven to be incredibly popular during this Con. People have been scooping them up by the armful! We’re thrilled, because we just want people to come into the Disney Store and see what we’re doing there. This is sort of an entrée to people to say, “hey, what does the Disney Store have available? They have something for me!” That’s why we really wanted to show here. Who wouldn't want to be friends? DEREK MCCAW: What were your criteria for which characters were going into the line in general, and which ones would be the exclusives here? JOHN BALEN: Ah. That’s a tricky question. We had much internal debate over which ones would be the exclusives. We’ve actually plotted out all the characters through Series 4. (Comic-Con saw the launch of Series 2.) So we’ve got 48 characters planned out. We wanted to spread the wealth. Some people love Mickey and Friends, like that whole family of characters. So we wanted to spread them over the whole series. There’s something for somebody within every series. We also wanted to show all of our favorites. Then it was also about the artists’ designs, whichever ones we fell in love with first and thought were nailed right out of the gate. We went after those. So we were really excited about some of these designs. As far as picking the exclusives goes, it was really about what kind of design twists we could put on the characters to be available here at Comic-Con. What would the Comic-Con guests really appreciate with some of these designs? 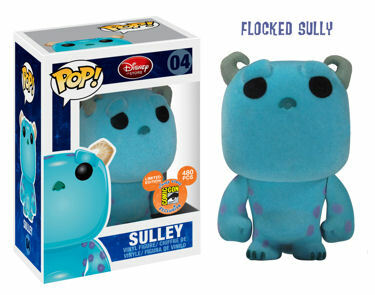 So that’s where we came up with doing a flocked Sully, which is perfect for Sully. That one’s my favorite. A glow-in-the-dark Mike Wazowski, like, so perfect. In the regular line Mike and Sully are great and they’re amazing. But they’re not flocked and they’re not glow-in-the dark! So it’s that extra little something for Comic-Con guests that makes it special. DEREK MCCAW: So are you going to get to wander the Con or are you going to be working here in the booth all weekend? JOHN BALEN: Oh, no. I’m going to be walking this Con. I’ve come since I was a little kid. I’m a big comic book fan, so I’m going to go off and see my favorite panels and my favorite guests. I’m actually spending the whole weekend here. DEREK MCCAW: Your company actually owns Marvel now, so what are your favorites? JOHN BALEN: We LOVE our Marvel characters here. We’d love to develop more and more with them. We’re just working through all the details of how we’re going to develop more product at Disney Store with Marvel characters. 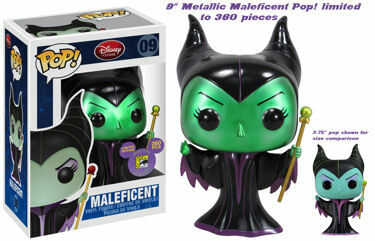 We do have a whole line of figurine sets coming out that we’ve done exclusively at Disney Stores. That’ll be coming out this fall, and actually, a whole Amazing Spider-Man set is coming out in a month. The Marvel designers loved this set. I can’t remember how many figures it is – 6 or 7 – good-sized figures for $19.50. It’s a great value and they look fantastic. Our designers had a blast with that. Me personally? I’m an X-Men fan – that’s one of our future sets, we actually have two X-Men sets coming – I’m a big X-Men and Avengers geek. Designer Gerald Mendez amidst his work... he listens to YOU. DEREK MCCAW: For the person who hasn’t walked into a Disney Store in a long time, what are you going to say to get them in there? To our more skeptical readers? JOHN BALEN: Yes! Please come in and see us! Know that the people at Disney Store home base, creating the product, are fanboys just like you are. We love this stuff as much as our guest does, if not more. We’re fanatical about it. Putting all the character and storytelling and all the make into our product is of the highest importance to us. We just want to give the guest in our store, who loves Disney, appreciates the characters, the storytelling and really understands the depth of story, we can go into the depth of characters and give that to our guests and they appreciate it. It’s really amazing what we can do at Disney Store. We have the whole library of characters available to us. We listen to our guests all the time. Guests looking for things in particular, we change our design direction in mid-stream when we get comments and feedback. “Okay, we think they’re going to like THIS better…” and we offer it up. We do focus group testing, we bring people in and show product to as many people as possible to get feedback, looking at Disney Store product in a unique and different way. We can speak to the true Disney fan.